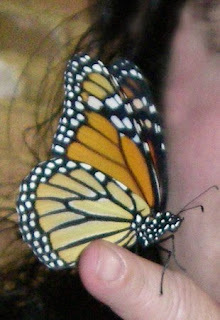 We have our first Monarch Butterfly! OK, it emerged on Monday and I'm just writing about it now. We have since released it yesterday. It was so pretty! 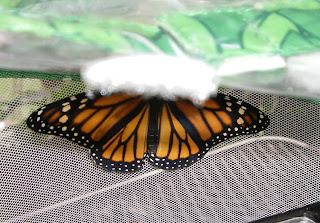 Within the next couple of days, we will probably have about 3+ more Monarchs. This isn't the greatest photo of it but look at it's wing span how pretty. This was when he took the container outside to let it go. It climbed up on my finger when I was letting it out of the netting while I was trying not to disturb the other chrysalises. It stayed there for about a minute, open/closing its wings and then flew off. This video was taken about a day after it emerged. It climbed up the to the top of the container and hung on the safety pin suspending the lid that the chrysalises are attached to. It was drying it's wings. You can barely see the clear chrysalis in the bottom right area (maybe too blurry) and then a full green chrysalis beside it. This weekend, my goal is to either create all the binding necessary for the breast cancer quilts or to quilt at least two of the four quilts.